Delmon Young is "very, very much out there"
Of course, the "rival GM" may just be trying to stir something up, if he is in fact a GM of a "rival." But we all know that the Twins were not particularly pleased with the way Young performed last year, although for a 22-year-old, he still was league average at the plate and although his defense was sub-par, he still made strides at the plate that reminded us that he is still very young and we shouldn't expect too much, too fast from him. Unfortunately he only hit 10 home runs and although that was good enough for 10th on the team, it was the only thing people said about him when the season was all said and done. Surely we all expected him to hit more than 10, but is 5 home runs (which really is all that separated him from being crucified and loved) really worth giving up on a 23-year-old? Especially the one player that actually has a future in the majors after you traded 2 substantial players and a good prospect for him? Obviously there are things that we don't know, such as how he got along with the coaches, how his work ethic were, etc. but if we're going by what's on the stat sheet, he surely deserves to stay. There are really only two pluses to trading Young right now. The market value for a right-handed outfielder is pretty good, and the Twins should be able to get a good player in return. Also, out of all the surplus of Twins outfielders the Twins have, he'd likely net the most in return. But there's a reason for that. It would clear up a spot in the lineup so that the Twins wouldn't have to bench another one of their outfielders and they would be able to start both Span and Gomez in the outfield, which would give the Twins two great defenders in the outfield everyday of the week. I think the Twins should be able to get a good player in return. I don't know who the Phillies would be willing to give up, but the only player I could see the Twins target would be prized pitching prospect Carlos Carrasco. Is that too much? In my opinion I think it's pretty even, but it'd all depend on how badly the Phillies would want Young. They had one of the best offenses in baseball last year, so I think it'd probably be too much in their opinion to trade their top prospect for a (at least right now) league average outfielder. My ideal trade for him is for a player I have mentioned many times on the site, but once again it would make sense for both teams. Yunel Escobar, if you cannot tell, is the player I'd m ost like to see in a Twins uniform this off-season. Sure I'd love to see J.J. Hardy in a Twins uniform too, but with the price it'd take to acquire Escobar compared to Hardy makes the Braves shortstop much more attractive. Escobar for Young straight up would be a good deal for both teams. The Braves would get their outfielder who they're looking for and also the right-handed bat they are also looking for. The Twins on the other hand would receive the shortstop they desire who also happens to be a perfect fit for the #2 spot in the lineup before a two-time AL Batting Champ and former AL MVP. The 26-year-old Cuban is under team control through 2013 which would give the Twins a long-term option at shortstop. He is a solid defender and would give the Twins another player with outstanding range up the middle of the infield. The Twins would be losing possibily there only outfielder with any sort of good power potential (20+ home run potential). I would hate to see Young go, however if he were to be traded, I hope the Twins won't sell themselves short just to trade him and will actually try to get equal value for him. If you don't get it from the title, this off-season has been a complete "Snooze Fest." Surely this isn't any different than previous off-seasons, however since many of us loved the Twins talk and trade speculation that was last off-season, this has just been harder to adjust to. December 1: Last day for teams to offer salary arbitration to their former players who became free agents. December 7: Last day for free agents offered salary arbitration to accept the offers. December 8-11: Winter meetings, Las Vegas. December 12: Last day for teams to offer 2009 contracts to unsigned players. As you can see, there is some activity that can and will happen prior to the first week or two of December, however the majority of the off-season action will occur in just a couple of weeks. "One of the things that is so attractive about Minnesota is he knows the area, he knows the stadium, he knows the people," McDowell said. "All the feedback that I get from him about the Twins is positive." is is a very positive thing to hear. Blake is supposedly looking for a 3-year deal however I unfortunately have the feeling that the Twins may go beyond that to land him. The deal I see the Twins proposing is a 3-year $21 million deal with an option for a 4th year making the deal potentially be worth $28 million over 4 years. When hearing that the Twins may be interested in Blake, I was all for it. However even thinking about offering 4 potential seasons for him is a bit alarming. All I can say is that if the Twins did do that, that it's a team option so they aren't unwillingly stuck with him at the age of 39. The Twins are said to be one of 8 teams interested in adding Blake to their lineup, but like I mentioned the Twins appear to be the front runners as I type this. Many are not enthused about acquiring Blake and would rather see us trade for a player such as Garrett Atkins, Kevin Kouzmanoff or Adrian Beltre. Surely those are all good options, however I still to this minute believe that Blake is the best option for one main reason: He won't cost the Twins anything. Obviously he will cost something, however it will not come at the price of a player which in turn will allow the Twins to use the same player(s) that they'd use to acquire one of the other third basemen, and use it to trade for a shortstop and/or a relief pitcher. 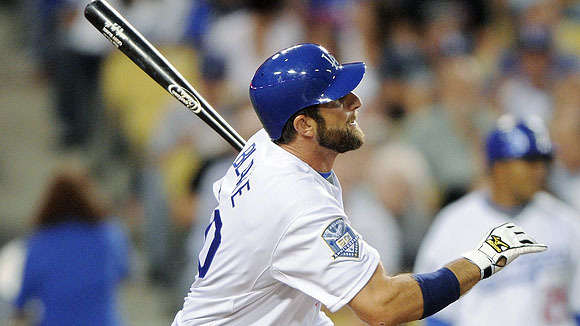 Blake is thought of as the best third baseman on the free agency market. The best shortstop is without a doubt Rafael Furcal. The 'word on the street' is that Furcal is looking for at least a 4-year deal and will likely command at least $12-15 million annually. Surely he could be a much bigger asset than Blake, however for possibly twice the amount would you do it? Especially considering that he missed almost all of last season with a serious lower-back injury. Obviously there comes a risk with signing him, just like there is a risk with signing Blake. The only difference is that Blake's risk involves his age, while Furcal's risk involves his health. The point I guess I am getting to is this, since the Twins are linked to the top free agent third baseman, and not the top free agent shortstop, I feel that they should now look to trade for a shortstop if they are in fact able to sign Blake. Obviously my theory could be flawed, in that the second best shortstop could be also be better than the top third baseman, however after Furcal the next best thing at shortstop is Orlando Cabrera, who like Blake is aging fast and would also be a huge risk to sign. I will admit that the comparison between Cabrera and Blake is much more parallel than the comparison between Blake and Furcal. Again, I still believe that signing Blake is a much better option than signing Cabrera and attempting to trade for a third baseman. The market this off-season for third basemen is extremely thin, which is why many teams with third basemen are likely to ask for slightly more than what the player is worth, just because the demand for third basemen appears to be pretty high. I don't want the Twins to fall into some sort of puppet-act by an opposing GM and allow them to just pull all of our strings until we oblige and part with a few players that we'd like to keep, just because there isn't a suitable option (after Blake) on the open market. Sure many probably disagree with the way I hope for Twins to pursue their new coming players, and really nobodies way is the "right way." I think there are plenty of options that the Twins could do, this is just one that I think is most likely. I am also sure many believe that they could sign more than just one player. Although that is very true, after the Twins added players to the 40-man roster, they left one spot open which is believed to be for an incoming free agent. Obviously there are ways to clear more room on the 40-man roster, however the Twins seem pretty set with their current group of players they have on the 40-man and I think that any room cleared on the roster will have to come via trade. This gives the Twins an open spot on the 40-man roster which allows them to add a player that they could draft in the Rule V Draft. Yunel Escobar is my top shortstop choice based heavily on the fact that J.J. Hardy would cost probably twice as much to get in terms of players and is a better defender. Since there are really no shortstops on the horizon of becoming assets for the Twins, I think they should go after a young, talented one to fill the gap between second base and third base for the foreseeable future. Escobar would provide great defense and a stable bat to our team and could really be on the cusp of stardom. I think the Braves would consider that trade for the purpose that they would be acquiring Glen Perkins who is a suitable starting pitcher when they are incredibly bare in that department. They're also supposedly interested in acquiring a right-handed outfielder who could be added to the middle of the lineup, which just rings 'Michael Cuddyer.' They also would be getting another pitcher who could be a possible starter for them in Boof Bonser. I don't know if they would be willing to give up Jeff Bennett, at least in this deal, however they do have a few relief options that could help the Twins out. Bennett is merely just one of the options. Noticeably I am sure you may see that I have Denard Span in left field with Delmon Young in right. I just feel it may be a better switch for Young if he moved back to right field where I believe he may be more comfortable and I am also tired of seeing him try to chase balls in left field which has quite a bit more space. Left field may be best for the speedy Span. I know Blake in the 5-hole probably makes some sick to their stomachs, I just don't realistically see Young (at least off-the-bat) hitting behind Justin Morneau. That of course may be a different story if Young has a good Spring Training and if Blake doesn't. That's all I can really speculate for one night. Obviously my views are different than many others, but really I guess it's just safe to say that regardless of what the Twins do, it seems likely that they will upgrade one of their positions through trade. I personally just hope that it's a shortstop we are trading for, and not a third baseman. Hopefully something happens in the near future so that I can awake from this "Snooze Fest" of an off-season. Seth Stohs of SethSpeaks.net is widely known for his in-depth look at the Twins minor league affiliates and more particularly the players. He has had a countless number of Q&A's with minor league players and other people associated with the minor leagues. Many of us have the same love for the minor league's as Seth does, however none of us have put in the time and effort to deliver the same amount of content, which is really what separates Seth from the rest of the other Twins sites. "The culmination of all his (Seth's) hard work is this book that is deeper than anything ever published on the Minnesota Twins Minor League System." There is one person on the internet who is the "go-to-guy" when it comes to Twins prospects, and it is hands down Seth Stohs. Seth has put in a ton of work on this book and as you can see in his site, he provides great content and you will not be disappointed. He is one of the main reasons I started blogging in the first place and it would be great to see this book be a big hit. I encourage everyone that reads this site to pre-order a copy of the Seth Stohs Minnesota Twins Prospect Handbook 2009. For more information on the book, make sure to email Seth at SethSpeaksNet@hotmail.com. Today marks the beginning of the Free Agency period in which free agents are allowed to discuss contracts with teams of their choosing. The Twins have 4 players that have filed for free agency, including pitchers Eddie Guardado and Dennys Reyes and infielders Nick Punto and Adam Everett. Reyes is the only player who qualified to bring the Twins compensation should he decide to sign a contract with a different team. Of course, the Twins will need to offer arbitration, and it's pretty apparent that they will. Reyes qualifies as a Type-B free agent, which would bring the Twins a supplementary round pick in return, which will be used in next June's MLB draft. Sid Hartman of the Minneapolis Star-Tribune believes that given the current state of the bullpen, the Twins are hopeful of re-signing Reyes. Reyes has served as the Twins primary left-handed reliever for 3 seasons, but with the emergence of two left-handed relievers - Craig Breslow and Jose Mijares - it looks like Reyes may no longer be needed in the Twins bullpen. As of right now, it looks like Mijares is our go-to setup guy with Breslow likely our go-to guy against left-handed hitters. Since Reyes has been nothing more than a LOOGY, I would rather see the Twins acquire a reliever who could push Mijares for the setup role. Most of these guys have closing experience, which means that handling setup roles should really be no problem. Chad Cordero is a young, talented reliever who is currently recovering from shoulder surgery which is a big risk, but could be a steal if he returns to anywhere near his old form. Kyle Farnsworth had a terrible second half of the 2008 season, but he really isn't a terrible pitcher. He could be a cheap 1 or 2 year signing. Eric Gagne could also be a steal, however the chances of him returning to a dominating reliever are incredible slim. He may be the biggest risk, highest reward on this list, but I think the Twins will probably stay away from him. Jason Isringhausen had a bad 2008 season, but his track record shows that he's a very good reliever. Hopefully last season was an outlier and he will return to his old form. David Weathers wasn't great in 2008, but he could be a serviceable option. The guy I find most desirable is Brandon Lyon. In 2008, Lyon served as the Diamondbacks primary closer in the first half before Chad Quals took over in the second half when Lyon really struggled. Lyon is a 29-year-old right-handed reliever with a career 4.46 ERA and 51 saves in 416 innings of work throughout his 7-year career. He obviously is not the most desirable guy on the planet, but considering that he won't cost either a draft pick or a lot in terms of salary, I think he is a realistic option for the Twins. I can see a 3-year $13 million deal as a realistic contract for Lyon and I think that that's certainly within the teams limits. Joe Christensen of the Minneapolis Star-Tribune believes that the Twins will look to upgrade the team through trades instead of free agency. I don't know if that is more so in reference to upgrading the infield, but I can see the team also acquiring a reliever through trade as well. Phillies reliever Ryan Madson is one player for instance I could see traded. You may think, "are you crazy?" And before responding with, "sometimes" I guess I should explain my reasoning for suggesting this. Surely Madson was the best reliever on the Phillies roster last season besides closer Brad Lidge. He played a huge role in their World Series victory and is the bread to Lidge's butter when it comes to the 8th & 9th inning for the Phillies. However, with the lose of Pat Burrell, the Phillies lost not only an outfielder but also a right-handed bat as well. That's where the Twins could come in. Michael Cuddyer missed the majority of the 2008 season with various injuries, but when 100% healthy is a pretty good outfielder with a good bat capable of hitting in the middle of any order. The Twins have a little bit of a logjam in Major League outfielders, so if the Twins could move one of them for a position of need, it certainly would seem to be a good move for the team. Although other players could be included, I think that Cuddyer for Madson is a pretty fair deal. I do think that the Phillies may need to add another player to even it out. And perhaps the Twins could sweeten the pot and try to get Jason Donald from the Phillies, who is a shortstop/thirdbase mix with a great looking bat and despite not a lot of attention, looks to be a great player. The Twins would love to get Donald from the Phillies, I am sure. Perhaps I am starting to become overly obsessed with improving our bullpen, but I do think it's a position that needs to be looked at with a high priority. And although I am sure many will disagree with the players involved in a possible trade, I think it's safe to say that the Twins need to add a player who can change our bullpen and I think the sooner they do it the better. The Twins don't want to be sitting here in February without improving their bullpen, and possibly allowing it to determine their seasons fate once again next season. So far the Twins have only been linked to having interest in one free agent, that being Casey Blake. The 35-year-old third baseman from Des Moines, Iowa seems to be a better fit with the Twins than either Garrett Atkins or Kevin Kouzmanoff who both have been linked to the Twins recently and would both cost a lot more than just money to acquire. Blake through 917 games and 3,304 AB's, Blake has averaged 23 home runs, 79 RBI with a hitting line of .264/.334/.447 and an OPS+ of 105 in his career. He doesn't play outstanding defense, however he is definitely capable of playing everyday. Blake is said to be looking for a 3-year deal and is expecting to see an annual salary of somewhere around $6 million per year. I don't see the Twins offering 3 full years for Blake, but I could see a 2-year deal with a an option for a 3rd year. If the Twins could acquire either a third baseman or a shortstop through free agency, I think that leaves quite a bit open to acquire a shortstop through free agency. Sure the "word on the street" is that the Twins will probably only upgrade one of the two infield holes (third base/shortstop) and fill the other with "in house" options. Brendan Harris and Matt Tolbert are said to be options at shortstop if the team acquires a third baseman, while Harris and Brian Buscher will likely platoon (like they did for a portion of the 2008 season) at third base if they were to acquire a shortstop. Personally I would like to see both infield positions filled from outside of the organization, but I know that is seriously unlikely. The Twins have plenty of money to sign a good free agent such as Rafael Furcal, however the team is not likely to go after any of the prized free agents, meaning Furcal is likely out of the question. Of course the big acquisition would be Yunel Escobar, who's name has also been linked to the Twins as of late. 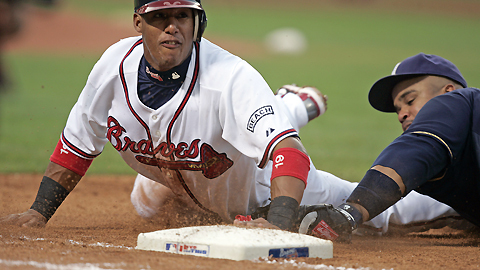 Escobar is a 26-year-old above average hitting and fielding shortstop from the Atlanta Braves organization. His name has been at the center of the Braves-Padres rumors in which former NL Cy Young winner Jake Peavy would be traded to Atlanta for a package of players headlined by Escobar. Although I am sure the Braves would hate to add his contract, I think the Twins could make a good enough package to acquire Escobar from the Braves for Cuddyer. I am sure that other players would be involved on both sides, perhaps the Braves would like to get rid of a contract or two? Regardless I think that shortstop is so weak (with respect to Furcal), that if the Twins really want to make an upgrade at that position, it certainly would have to come from a trade. Third base is also weak, however I do think that the Twins have honest interest in Blake and I think that signing him would be ideal for this team. If they choose to sign a shortstop, I hope that the team just chooses to re-sign Punto who with his defense and price is probably the most attractive shortstop on the market (again besides Furcal). We'll see I guess, only time will tell what the Twins intend on doing. I hope that the team heads into the Winter Meetings with at least one of the three priority areas filled so that they don't have to worry about acquiring more than one player that time. I also hope that the team looks into signing Jason Kubel and possibly Scott Baker long term. Baker more so to just avoid arbitration and to take a year or two off of his free agency. I also would like to see Kubel signed to a deal which also takes off a year or two of his free agency. We'll see I guess, certainly this off-season has not been nearly as exciting as last years, but I hope that Bill Smith and Co. don't leave us disappointed and can come away from free agency feeling like they really made an impact on the team and in 2009 will be fielding a team that their fans will be proud to support. • As I am sure you already know, Twins reliever Pat Neshek will be out for all of the 2009 season after suffering a complete tear of his ulnar collateral ligament. He missed the majority of the 2008 season with the injury, but since it was only a partial tear, the Twins decided that he would be best off just rehabbing the injury instead of immediately undergoing the surgery. Well, after feeling discomfort in his arm during his throwing program last week, an MRI showed that it was fully torn and the surgery would now be necessary. I share the same disappointment in Twins management as everyone else does at this moment. I was skeptical at the initial reports last May of Neshek being told to rehab instead of undergo surgery, so finding out that we're going to go nearly two years before we see our favorite submarine pitcher take the mound is very unsettling. "I'm extremely bummed out right now and am at a loss of words," Neshek wrote in an e-mail to the Star Tribune. "Kind of a numb feeling ... just depressed, I guess." I think that sums up how everyone in Twins Nation feels right now. Arguably the biggest weakness last season was the bullpen, and to see a guy who could have helped insermountably go down with an injury really bites. The bullpen struggled mightily last year and prior to his injury, Neshek wasn't any different. He had a 4.72 ERA in 13.1 innings to go along with a 1.20 WHIP. Neshek really started to decline in the second half of the 2007 season, and was hit hard in a few appearances this spring. Hopefully this can cure his problem, but with his quirky delivery, it's really hard to see him coming back 100% from this injury. I believe many (including myself) viewed him having too much of an influence on next years bullpen, which was really unfare being that he'd be coming back from an injury in which he's been out for nearly a year. Before his injury, the Twins probably should have still acquired a strong reliever either via free agency or through trade. Now, it's a must. There are some pretty good relievers available on the open market, as well as on the trade market. I don't see us acquiring a guy like Huston Street, which has been thrown around, but I do think that guys like Brandon Lyon, Juan Cruz or Heath Bell are all well within reach. Other guys that the Twins may target (in no particular order): Kevin Gregg, Russ Springer, David Weathers, Dan Wheeler, Bob Howry, Dog Brocail, Frank Francisco, and Ryan Madson. I don't see there being an internal fix to our bullpen problems, at least not yet. The Twins have two well-known relievers (at least in Twins Nation) in the minor leagues. They are Rob Delaney and Anthony Slama. Both probably should be at least one level higher than they are now, and both could probably still be ready to help the Twins bullpen come mid-2009. Philip Humber and Kevin Mulvey were both acquired in the Johan Santana trade last winter and both could be used in the bullpen. Humber does not have any more options and likely wouldn't make it to the minors through waivers, so if the Twins wish to retain him they may be forced to either clear room in the rotation or bullpen with the bullpen being the most likely of destinations. However, the Twins cannot depend on a couple prospects to fix the problem. I am even skeptical of the high hopes that have been put on Jose Mijares, just because he's still young and we haven't seen a whole lot of him. The Twins have a steady foundation in their bullpen with plenty of hope of a rebound, even without Neshek, however they cannot afford to allow their bullpen to determine their fate like they did this last year. So with that said, I expect to see a new reliever at some point before next season, and not just a mediocre one. Past Joe Nathan, there are just too many questions with the remaining members of the bullpen to just sit back and not do something pretty big. We have no clue how Matt Guerrier will rebound. Jesse Crain had an o.k. return to the bullpen after missing most of the 2007 season, but was far from being a great asset. Craig Breslow looked good, but has bounced from team to team for a reason. Also, Boof Bonser was absolutely dreadful and really can't be counted on at this point. The team is also expected to let Dennys Reyes leave, netting a draft pick in return. There are plenty of guys out there, I just hope the Twins can net a good one who can come in here and help turn our bullpen around. (AAA) Rochester: Howie Clark, INF; Julio DePaula, RHP; Danny Graves, RHP; Tom Shearn, RHP; Ricky Barrett, LHP; Carmen Cali, LHP; Mariano Gomez, LHP; Garrett Jones, 1B; Sergio Santos, SS; Darnell McDonald, OF; and Tommy Watkins, OF. (AA) New Britain: Jason Miller, LHP; Felix Molina, 2B; Joe Gaetti, OF. I don't expect to see Garrett Jones or Darnell McDonald return, but we'll see. I do expect to see a few guys stay with the club. It would be nice to see the Twins retain Howie Clark who seemed to be a good influence on our AAA team. It'd also be nice to see Mariano Gomez and Ricky Barrett be retained after both having strong 2008 campaigns. • After Matt Holiday was traded by the Rockies to the Athletics for two pitchers and an outfielder, the Rockies next move may be to move third baseman Garrett Atkins. Last week I wrote about the possibility of Atkins becoming a Twin, and my stance is the same, if we can get him without having to overpay, then go for it. But the Twins by no means should overpay for him as many in the Twins Blogosphere have stated, he really is not much better than either Casey Blake (who would be cheaper and wouldn't require a compensation other than money) and isn't worth the price with Brian Buscher and Brendan Harris both on the bench, and both could put up servicable numbers (combined) while playing as bad of defense and only making a fraction of the cost. However, there is now talk that the Rockies may be looking to swing a deal with the Reds in which Willy Taveras and Atkins go to Cincinnatia. Perhaps that could lead to an Edwin Encarnacion trade, and the Twins could be a potential suitor there as well. I personally would rather just go after Blake if our choices were between Encarnacion or Atkins in a trade. I still have hope that Adrian Beltre could be traded. If the Twins decide to stay pat at third, I hope that they get one of Yunel Escobar, J.J. Hardy or Rafael Furcal to play shortstop. We'll see I guess. There are still teams that are trying to make big trades, so the Twins may take the wait and see approach to see what's left after the trades. I just hope they don't miss out on improving our team. The Twins and Rockies have reportedly begun discussing possible trade scenarios that would bring the Twins third baseman, Garrett Atkins. The Rockies reportedly may have interest in Michael Cuddyer, which could solve a few 'problems' the Twins currently have. I discussed a potential Atkins trade back in May, so it really isn't surprising to me to see his name connected to the Twins once again. Atkins is a talented third baseman who is a proven run producer. Unfortunately for him, his home/away splits are very alarming which making any potential suitor skeptical of acquiring him. He also is not a terrific defender, which makes it questionable as to how much of a leash he'd have with manager Ron Gardenhire. Surely if the Twins acquired him, they'd definitely be looking for a top-notch defensive shortstop to help fill the gap. Cuddyer is one season into a three-year contract that he signed last winter. He is a fan favorite as well as a clubhouse leader. However, the departures of both Torii Hunter and Johan Santana (both who are looked up to in the clubhouse) in the same off-season, they likely won't be too hesitent to deal Cuddyer. Michael is coming off of an injury plagued season, which in turn has his value (at least perceived value) incredibly low right now. The fact that the Rockies are willing to trade a cheaper and better player for Cuddyer, certainly puts the theory that his "current value is low" to rest. The problems I see in this rumor is that the Twins will also likely need to part with another player in return, more specifically a young pitcher. I personally don't see a point in trading any of our young five starting pitchers, it just makes no sense unless we get something pretty significant in return. So if the Rockies want Cuddyer and one of our young starting pitchers in return, they can forget about it. However, that doesn't mean that I am opposed to trading a prospect along with Cuddyer for Atkins. A player such as Philip Humber, Anthony Swarzak, Kevin Mulvey or Tyler Robertson would probably interest the Rockies and I don't know if I'd let any of them stand in the way of acquiring Atkins. I am also sure that they'd be interested in a guy like Jose Mijares, however I would at least hope that the Twins wouldn't part ways with him given how bad their bullpen was this year. So if the trade is Cuddyer and a prospect or a pitcher such as Boof Bonser, I certainly could be on board. However if the trade is for Cuddyer along with one of our young starting pitchers, then they can forget it. I would rather see Cuddyer play third base. Atkins is under team control for two more years, however if you really take a look at it, he and Cuddyer will likely make around the same amount next year. The Twins would be getting a good middle-of-the-order bat at a position of need, however I just hope that they do not overpay for him. He certainly has his flaws and watching him over the past three seasons, you can see that his numbers have taken a significant drop each season. That along with his putrid defense and terrible stats away from Coors Field, the Twins need to be careful if they do try to acquire him. His cost could be at a premium right now, which frightens me. If the Indians are also interested in acquiring him, I wouldn't mind to see them overpay for him instead of the Twins. Other thoughts on this rumor, click here, here, here and here. Charley Walters of the Pioneer Press would not be surprised to see Delmon Young traded to the San Diego Padres for Kevin Kouzmanoff. This isn't a great rumor, more so just a thought, but being that this off-season has been incredibly slow (in relation to last-years), I think it's something worth discussing. Kouzmanoff is a 27-year-old third baseman with good power. He is not great defensively, but is without a doubt good enough to play there everyday. He was worse in the league (among third basemen) with a .299 OBP and his OPS was 3rd to worse. He is under team control through 2012, but will be 31 at that time. Young's name has been in most of the Twins' rumors this off-season due to the fact that there is word that he doesn't fit in with the overall team and doesn't seem to give it his all on every play. Although I believe that some of that is due to the fact that he was a 22-year-old player on a brand new team, I do see why some would like to see him traded. He probably would net the most in return out of any of our outfielders and with a surplus of starting outfielders, the Twins probably would be better off by trading one of them for a position of need. I don't discourage a Delmon Young trade, however I do discourage them trading for anything less than an All-Star caliber player in return. Kouzmanoff for Young might have been better for the 2008 season, and it might be better for the 2009 season, but I am willing to bet quite a bit that by 2010 the Twins would be regretting that trade immensely. Young has the potential to be a perennial All-Star some day, while Kouzmanoff will likely always be just an o.k. player. One of Young's biggest downfalls is his lack of discipline at the plate. He swings at first pitches too often and doesn't walk enough compared to his strikeout numbers. However Kouzmanoff at 4 years older is worse at the plate in terms of discipline. Kouzmanoff has good power right now, but I think that 23 home runs is certainly in Young's range at some point in the not-too-distant future. The Twins I believe could get Kouzmanoff without having to give up Young, and really in my mind if that's the player they are requiring, then either they up the ante or the Twins walk away. This trade solves a couple problems for the Twins, it clears up a spot in the outfield permanently and it gives them an answer at third base. Personally, I'd rather see the Twins sign Casey Blake, Joe Crede or Hank Blalock to one or two-year deals and wait until Danny Valencia or Luke Hughes are ready (possibly) by the end of the 2009 season. I think that the price for Kouzmanoff is just too high and the Twins would definitely regret this decision in a couple of years.